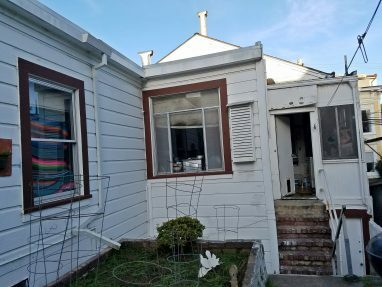 We've heard it all before, a 'tear down' sells for $800,000 here, a small house with bay views sells for $2,000,000 there, but for me this San Francisco real estate story takes the cake. 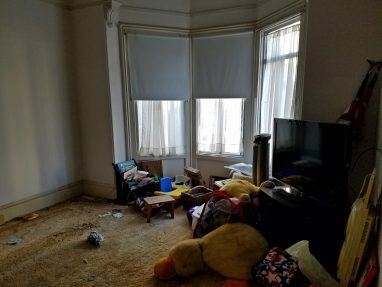 I just sold a smelly, 117 year old, 1200 square foot, major fixer of a home, only steps away from a homeless encampment, for $1.4 million. An elderly lady passed away in her home of over 50 years, leaving it to her son. She had a reverse mortgage on the home, and under the terms of her agreement, the loan would have to be paid off upon her passing, or it would go into foreclosure. Not having the nearly $600,000 needed to pay it off, her son was forced to sell it, and hired me to do so. We made the trip down to San Francisco to take a look, and found that it was in pretty rough shape. 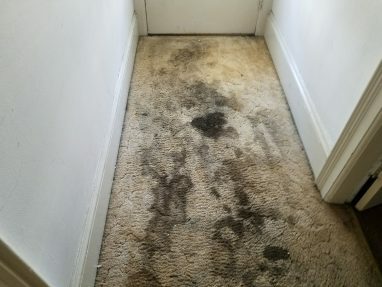 The carpet smelled from years of 'accidents' from her dogs, the back window frame was broken in such a way that it had to be propped up to prevent it from falling in, and the drain pipe under the toilet dripped down into the garage with every flush. The house needed everything from the plumbing to electrical, flooring, paint, windows and appliances. The situation was complicated by roommates. There were two of them. When informed that the house was being sold, one made arrangements with the seller and moved out. The other got a lawyer. In San Francisco, the law heavily favors tenants, and in most cases, sellers end up paying tenants to leave. The front page of the San Francisco tenant's union web page reads, "Just because a landlord is selling a property, or just bought it, is not a ground for eviction (even if it’s a foreclosure)." Under a law in effect at the time, landlords 'choosing to exit the rental market' were required to pay up to $50,000 per tenant for relocation, and to top it off, the tenants would have 45 days to reconsider and move back in. That's right, not only would you have to pay a tenant as much as $50,000 to leave, you'd also have to wait and see if they'd change their minds and come back, and if they did so, you would have to let them move back into your home. Although the law requiring payments of up to $50,000 was struck down a few months ago, that didn't mean that the remaining tenant was going to cooperate. Tenants can take legal action to make evictions difficult, costly and time-consuming, so for many, it's better to pay them to leave. The tenant said she'd move out for a payment of $70,000. The owner didn't have it, and found it that number unreasonable. Without the funds, knowledge or time to fix it up and get more value from it, he decided to sell it as is. All of the home's issues should lower the value, correct? We sure thought so, until we were contacted by 2 different investors who wanted to purchase the property. Housing is so scarce in San Francisco that investors search death records, find out if the deceased owned any real estate, then track down their heirs in an attempt to get at properties before they hit the market. Each said they would take it 'as-is', sight unseen, and take responsibility for dealing with the tenant. After a little negotiation, the seller accepted an offer of $1.4 million. He went on to say that he was going to gut it, so the way it looked and smelled didn't matter. He didn't get too specific, but said that he'd likely turn it into 2 or 3 housing units. He also said he'd set aside some money to get cooperation from the tenant. The buyer dealt with the tenant, and now goes about the estimated 12 to 18 month process of obtaining permits to remodel the place. So, there you have it, another 'the San Francisco Real Estate Market is Crazy' story. This is an example of why unless one is wealthy, one ain't buyin' in San Francisco. It's driving people to the East Bay and beyond, where their prices are skyrocketing, and others, like me, to move to the Sacramento region, where one can be a better quality of life for about 1/3 the price of the Bay Area. Homes for sale in Folsom, for example, average about $535,000, and some areas of Sacramento, about $350,000. As I mentioned in a previous posts, an estimated 200,000 people leave the SF Bay Area per year, and about 18,000 of them move to the Sacramento region. Why then, are prices still climbing? Because MORE people keep on coming! Most San Francisco residents can't afford to buy and with rents averaging $3600 per month, it's now wonder that recent polls showed 83% of renters plan on leaving. In spite of all of this, the world loves San Francisco, warts and all. I visit often, going to restaurants, listening to music, visiting parks, attending events, and selling homes. In recent years, however, it has become the 3rd most densely populated city in the country, and has the highest property crime and highest auto burglary rates in the country. I can't afford to, nor justify the cost of living there. If you're looking to exit the Bay Area and head up to Sac, drop me a line. We were the opposite. We didn't buy down there when we had the chance. Young and dumb. My friends who bought for $200k to $350k back in the 90's are sitting on million dollar properties now. As for the big storm coming, what do you feel will be the cause?